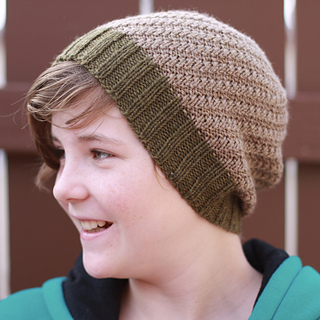 A unisex beanie with a simple texture perfect for striping. Designed to make the most of a beautiful set of mini-skeins, Ascent is highly customisable. You can use any number of colours, arranging them in wide stripes as in my version or creating your own stripe pattern. The stitch patterns allow you to switch colours almost anywhere (no need to complete a round). Skills needed include knitting in the round, knit and purl stitches, ssk decreases, and changing yarn colours. Materials: 160 yards of DK-weight yarn. 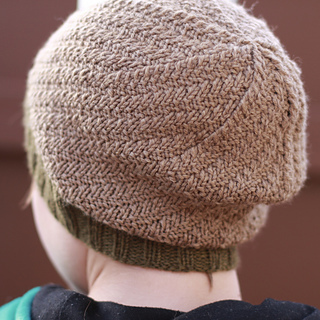 I made two hats using a madelinetosh ‘Tiny Twists Kit’ (five 50-yard skeins of DK Twist) in ‘Neutrals 1’, plus half a skein of Vintage Purls Max in ‘Abel Tasman’. If substituting, choose a smooth yarn with good stitch definition. Sizing: One size fits most adults, up to 24” head circumference. On heads larger than 22” the small peak at the crown will be less pronounced. Suggestions are included for resizing.